A coworker and I came here for lunch one afternoon – I had read good things about Zen Palate’s veggie burgers and was eager to check them off my list. Our waiter took awhile to get around to taking our order, but once we got his attention he was very apologetic and friendly so although the service continued to be a bit inattentive throughout our meal, we forgave him. I ordered from the lunch special menu – $8.95 for the “zen burger with yam fries” and a pineapple iced tea. Not a bad deal. My first bite was pretty satisfying. 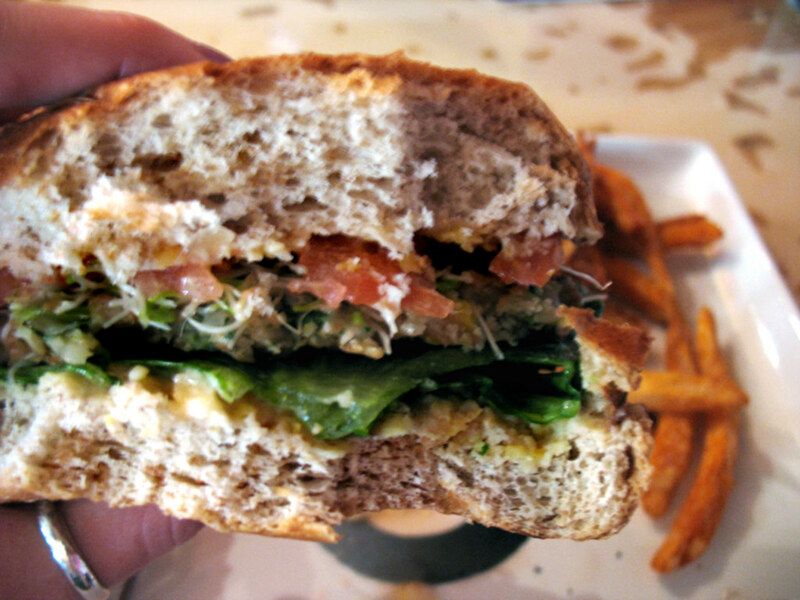 The bun felt like it was just starting to go stale, but the toppings were good enough to mostly make up for that – lettuce and a garbanzo bean spread beneath the burger, tomato and sprouts on top. The patty itself tasted great. I could see bits of corn and a few other vegetables, but they were mixed together so well you didn’t taste a different one in each bite (which is often a complaint I have about some lower-quality patties). It wasn’t the most mind-blowing burger I have ever eaten, as described by some reviews I had read online prior to this lunch. But it was a pretty darn good burger anyway – a solid three stars. And the yam fries were amazing. I have to give them credit for 1. Offering yam fries as the default side instead of regular potato fries, and 2. Not charging extra because they are yam instead of potato. More restaurants should do this, in my opinion! The rest of the menu had some pretty tempting-sounding dishes as well, so I wouldn’t mind returning to try something else. 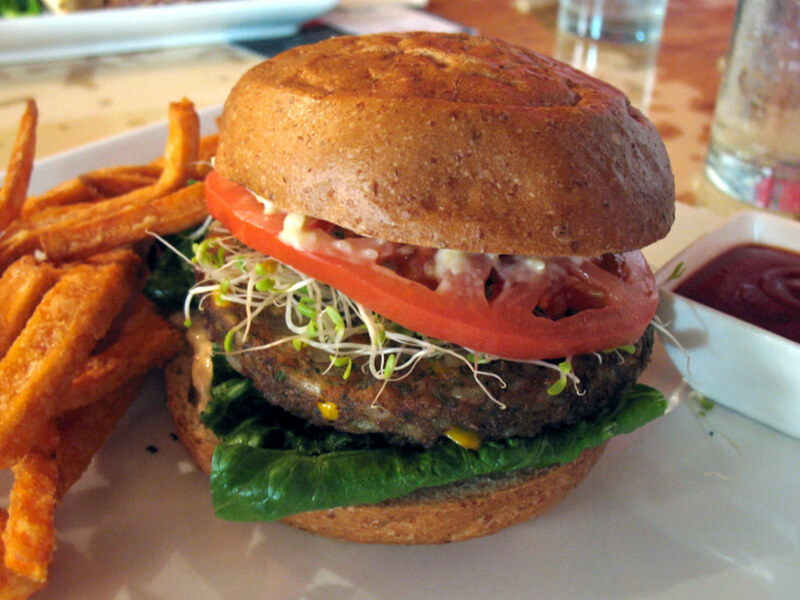 Although if I am in midtown and craving a veggie burger again, I also wouldn’t mind returning to eat this one again.